Olympic Marathon Champion Sammy Wanjiru Dies In Fall From Balcony : The Two-Way The winner at the 2008 Summer Olympics in Beijing would have been a favorite at the 2012 Games in London. Police in Kenya say he may have committed suicide. 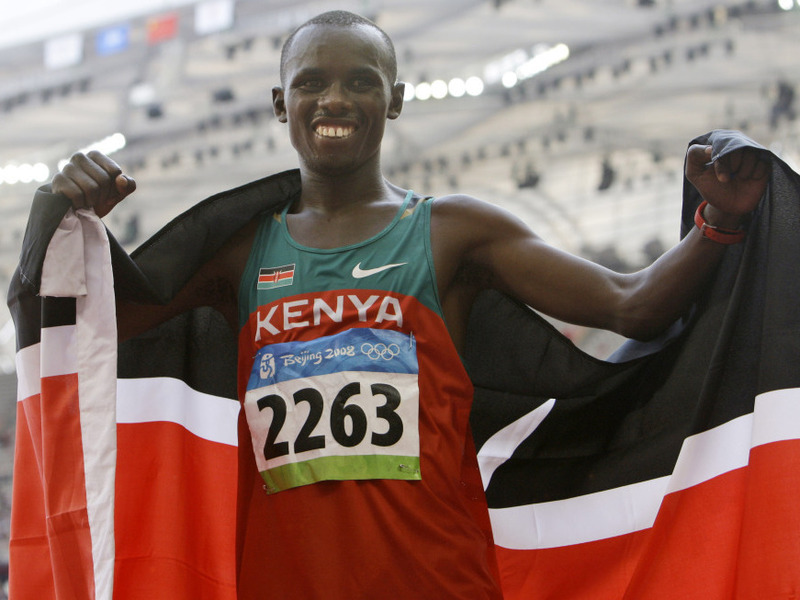 Kenya's Samuel Kamau Wanjiru celebrates winning the gold after the men's marathon at the Beijing 2008 Olympics; Sunday, Aug. 24, 2008. "Kenyan Olympic marathon champion Sammy Wanjiru died in a fall from a balcony after a domestic dispute involving his wife and another woman, [Kenyan] police said Monday," The Associated Press reports. From Nairobi, the AP adds that "one police official said Wanjiru committed suicide, while another said he jumped to stop his wife from leaving the house after she discovered him with another woman." Wanjiru, 24, won the marathon at the 2008 Summer Olympics in Beijing, finishing in an Olympic record 2 hours, 6 minutes, 32 seconds. He also won last October's Chicago Marathon and would have been among the favorites at the 2012 Olympic Games in London. The New York Times reports that "reached in Italy on Monday morning, Federico Rosa, Wanjiru's agent, said he ... could not believe that Wanjiru had killed himself. 'I am 100 percent sure there was no suicide,' Rosa said. 'That's completely out of the question.' "